This is the group of people who will do what they refer to as ‘roughing it’ and that typically includes sleeping outdoors. Within this category are two sub-groups. They include campers and RVers. Campers usually travel in smaller vehicles and will use tents for sleeping. The RVers travel in larger vehicles that they can also use to sleep, eat, bathe and relax inside. This is the group of people who will pack up a ton of luggage and venture off to stay somewhere in a motel, hotel or resort. They are the individuals who would rather sleep indoors and have four walls around them. Some vacationers will travel long distances to visit other places around the world. Others choose to vacation closer to home but still away from their residence. Since we are looking at the skills and tricks required when roughing it, we’d like to point out that you need to have a good handle on the nature you are going to encounter. Yes, bears do happen to do it in the woods, and sooner or later you are going to have to as well. Don’t expect the luxury of pit toilets to be present everywhere you park your rig or plant your tent. If you were wise enough to pack a lot of toilet paper, then you can skip this tip. Otherwise, you can do yourself a favor by boning up on the difference between poisonous and non-poisonous plants. You have to trust us on this one. To further back up the points made above, you could make that toilet paper last a lot longer and stay dry during your holiday if you get a bit crafty. All you need to do is use an empty coffee can – complete with snap-on plastic lid – to store a roll. If you’ve ever tented in a torrential downpour that soaked all of your belongings or your campsite got hit by a sudden flash flood from the babbling brook that you decided you had to set up camp alongside, you’ll appreciate this tip. Collect coffee cans during the year and use them to keep your TP or other toiletries dry. If there happens to be a campfire ban in place where you decide to park for the weekend, don’t pretend to be unaware. Notices of these things are usually posted at the entrance to a campground. If you are one of the brave ones that like to set up camp in a field nowhere near a regulated camping facility, you should have seen signs somewhere on your journey warning of a fire ban. If you are not sure, ask around at the last gas station you visit or listen to your radio. Claiming that you are just ‘passing through’ and thought a campfire in tinder-dry conditions would be a fun experience for the kids will not get you out of a fine. Oh, that’s right…expect to be fined for not paying attention. The same goes for fishing regulations. For those of you who feel that sleeping on the ground is a great way to get up close and personal with nature, you are right. It also means you may also discover that our planet tends to get pretty freakin cold when you sleep on its surface. This is why we highly recommend having a two-person sleeping bag in your collection of camping gear. Even if you are just dating and don’t know the other person all that well, this is a tool that will serve several different purposes. Without getting too graphic, the two-person sleeping bag will trap the body heat equivalent of two bodies keeping both of you toasty. It also keeps both of you close. It can also contribute to both of your becoming much closer than casual friends. There would be no real point to camping if you weren’t going to take advantage of the area you have set up to spend some time without a little bit of exploring. Even if you are an experienced hiker, wandering around in the woods you’ve never seen does require some thought and preparation. First off, you are going to see some spectacular flora and fauna that you would have missing zipping by on the Interstate. Second, you are going to get distracted which usually leads to getting lost probably. One way to prevent this is to use biodegradable trail marking tape that you can tie on to branches so you can follow them out and back to your tent or RV. Spoiler Alert: Your cell phone may not work so trying to GPS your way out may be a waste of time and result in a search and rescue effort that will add to the cost of your simple camping trip. If you are from The City and camping is sort of a hobby or thing you do to get away from your life for a while, there are going to be some hurdles that you will encounter. One of them is trying to keep the kids busy throughout the duration of time you are in camping mode. They should by now, get that this is more than just a quick pit stop along the highway. However, regardless of age, the ‘little ones’ are going to lose interest in S’mores and not having dry toilet paper. Here’s where you get to keep them busy for a day or two – organize a Scavenger Hunt. Put things on the list that require effort and combine chores with the task. For example, “Find The Clue Hidden Under Your Sleeping Bag After You’ve Rolled It Up Neatly” or something to that effect. It’ll be fun…for you. Typically you don’t need money at your campsite. That is, provided you didn’t set up camp at a privately owned operation that charges $25 for firewood and an additional $5 for matches. The message here is: Be Prepared. Have all the things you need to survive a night or more with you before you lock the doors to your house and exit the driveway. It just works out better this way. Now, if you end up playing poker with the campers beside you, you will need a few bucks. Otherwise, don’t bring a bundle and make a note of how far away you are from the next town in case you need to hit a bank machine to bail someone out of jail. There is something to the old clichés of ‘hitting the open road’ and ‘sleeping under the stars,’ but in order to pull it off with minimal emotional damage, you have to be ready in advance. You can’t expect to pick this up on the way there. Just because your drinking buddy camps all the time doesn’t make him an expert. If anything, it shows he is dedicated to not living in a house for extended periods of time. It’s not all that healthy in the long run. For ‘newbies’ it’s a good idea to rent an RV and give that a try. At least with wheels and a shell around you, the elements can shift on you, and you’ll still be somewhat dry and comfortable. The bottom line is that you can experience the world around you in a way you can’t be traveling in other modes. 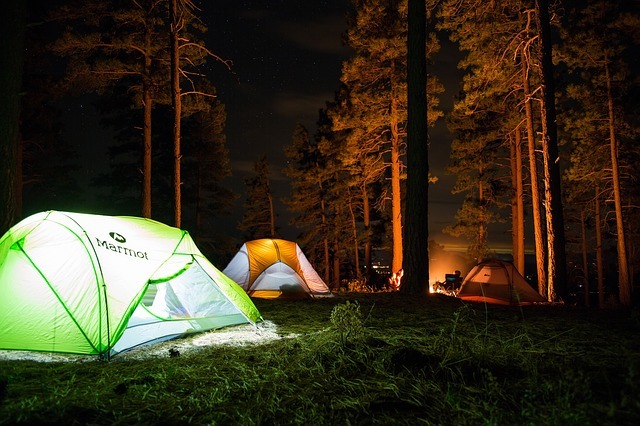 Camping teaches you a better appreciation for the outdoors – and the hazards that are present when you don’t take time to do it correctly.